Yesterday we were watching Visu’s “Makkal Arangam” – for non-Tamilians, it’s a chat show that is conducted in remote and urban centres by an erstwhile film director Visu and the show has been running for more than ten years. Visu picks up interesting topics and gets participants to debate, some stories are heart rending, some uplifting, some funny but you get great perspective of life. A lot of talent is also showcased and many students’ education has got funded in the process. A lot of social awareness has been generated and the focus has been to highlight social ills, constraints and challenges and find solutions. This particular episode had three groups – one saying we need to do something, have a purpose and achieve, one group that just said they were “ordinary” and the third group that just said “thank you God”. From the “thank you God” group, this lady spoke and just stole the show. Here’s a quick recap of her life so far – studies were stopped in the 12th grade, married off to a guy who didn’t want her to work, has two children, a boy and a girl, to help the children to stay in school, the lady goes to work as a sweeper in an office, signs in English and is asked to manage accounts, comes home and a few days later, her husband leaves :(. Things look up as she works at two jobs and puts her children through school, her son quickly helps by earning some money himself and they keep the daughter in school. Then the son is involved in an accident and loses his life. Then her daughter is married off, and her son-in-law abandons her daughter leaving a little baby girl. So now the mother, daughter and grand daughter live together and this wonderfully strong lady says, thank you God, am like the Thanjavur doll that can be bent to the floor, but will keep swinging from side to side and reach its original position. What an awesome attitude !! Her simple philosophy in life that she taught her children “don’t cry over not having shoes, think of what someone with no feet have achieved”. If you are born as a human being, you need the will to take life head on – her advise. She said, “God closed many doors, but opened a small window and I forced it fully open”. She quoted Swami Vivekananda who said “mental strength is spirituality” and exhorted everyone to live for others. She has been called names, but she says, I don’t care, I will win. Now think about all the useless things we complain about and remember this lady. Her granddaughter, all of six years old has already won 19 medals and in her school speech has said, she will grow up and achieve something big for her mom and grand mom. Want to know her name ? Her name is Manjula. Incandescent soul. 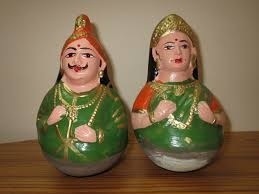 A tanjore doll is a type of traditional Indian bobblehead or roly-poly toy made of terracotta material. Its centre of gravity and total weight is concentrated at its bottom-most central core all the time so as to present a dance-like continuous movement with slow-damping oscillations. Hence it comes back to its normal seating position automatically after being tilted/disturbed anyway. Round-bottomed toys are unique[clarification needed], but other standing types are available too. Traditionally these toys are handmade and their exteriors are painted to an intrinsic sense of humour. Nowadays, they are also being made in plastics. Paul Polman – the one lever that is changing Unilever !